I only hiked the INT in the Negev. And even there I cherry picked and skipped some not so interesting sections. Hiking the rest of the INT is very, very low on my bucket list after reading Buck 30's trip reports of the entire INT. He disliked the Northern part of INT and loved the Southern part. 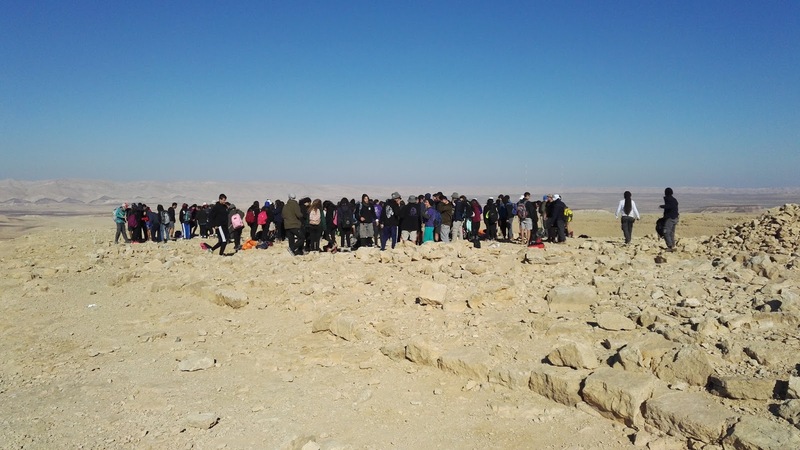 All my conclusions and recommendations refer to the Negev section of the INT only! Did I like this trip? Yes, tremendously! In fact, this is one of my Top ten hikes ever! I have hiked ten thousands of kilometers and I have hardly ever been on a trail where there are so many highlights every single day. When it comes to spectacular landscape this is one of or even the best hike in my entire career. The Negev is simply breathtaking! But would I recommend this hike to a friend? It really depends on the friend. This is not a hike for everyone and despite all its beauty I can see how this trail can also turn into a nightmare! Why? First of all this is also most technically difficult trail that I have hiked. You really have to climb at many places and these are not easy climbs. I was very happy to have a hiking partner this time to help me lower and lift our packs and have back up in case of an emergency. You don't have to be an athlete though - even teenage school kids manage to hike the trail. But they are in a group, have no backpack and can help each other. 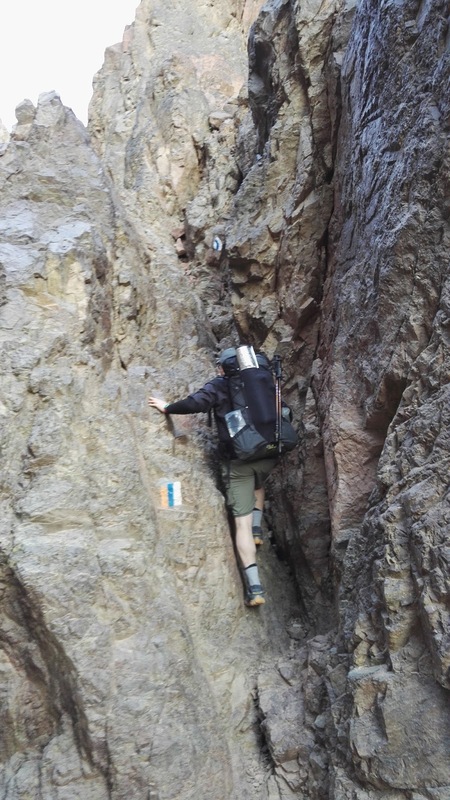 If you want to hike the INT in the Negev alone you should be sure footed, have no fear of heights and be fit. Very few diffult sections are equipped with ladders or cables to help you! Definitely bring trekking poles and try to keep your backpack weight as low as possible. At least navigation is not an issue. The trail is very well marked. You don't need a GPS. A smartphone is enough as a backup for navigation. But there is the water problem. We have hiked in winter with very low temperatures but also very little daylight. In December 3 to 4 litres per day were more than enough but hike earlier or later and you will be in trouble. Hiking the INT without expensive water caches is more than doable though. Just have a look at Buck 30's excellent water report that tells you all that you need to know. The only English guidebook of the INT by Jacob Saar is a total failure in this respect: It hardly describes where the water sources or even misses them! The guidebook is only good for its detailed maps - forget about the trail descriptions or good planning advice. Then there is also the "night camp" issue. Officially you are only allowed to sleep in the official night camps. You are not even allowed anywhere else in the Negev at night. And there are rangers who are controlling it - and fining offenders. These night camps can be totally deserted - or full of more than 100 screaming schook kids. Most of the nights camps we passed were full of school kids... Like Buck 30 we mostly stealth camped using LNT principles. Decide for yourself what you want to do! Also keep in mind that Israel is not a cheap country. In fact I found only two things to be cheap: bus travel and mobile communication. Buses run everywhere (except on Shabbat!) and you have cell phone coverage even in the desert. But everything else is expensive. You will not to be able to splurge or treat yourself very often. Bring hiking food from your home country if possible. There are a lot of trail angels along the INT though. The Negev is one of the most impressive and fascinating places I have ever been. Just make sure it is not more than you can take. We had to camp close to Sapir - a gated Kibbutz in the desert. It rained all night and the dry soil turned into a quagmire in the morning. But even in the drizzle the desert looked incredibly beautiful and we were more delighted when we found extra water bottles and two cans of tuna in the next night camp along the way: sort of an unexpected Christmas present! Actually this day turned out to be my most favourite day on the INT because it rewarded us with the best view: From the top of this plateau you look down into a wide wadi and you can see so clearly how time has shaped this canyon. And this is also the predominant feeling I had on the INT: How endless time is and how short your own life time! This great day ended with a great camp site just at the bottom of the plateau. The INT's next surprise was the "Ramon crater" which has nothing to do with volcanic activity. The crater is caused by erosion of the soft soil and it took the wind and the rain 25 million years to create this brilliant view. Ramon is an expression for the Romans who used to cross the desert here in ancient times when Palestine belonged to the Roman Empire. We were both tired now from strenous hiking and decided to have some sort of a "nearo" day. 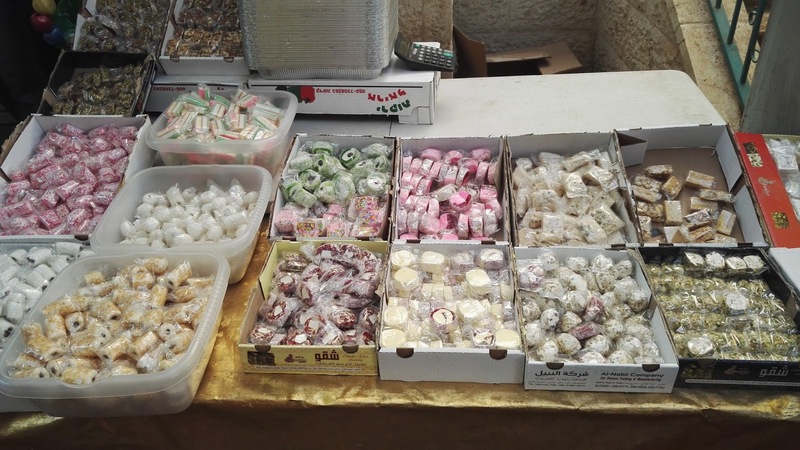 Therefore we hitched into the town of Mitzpe Ramon and did our resupply in the local super market where several people offered us help in decipering Hebrew cooking instructions on packaged food. 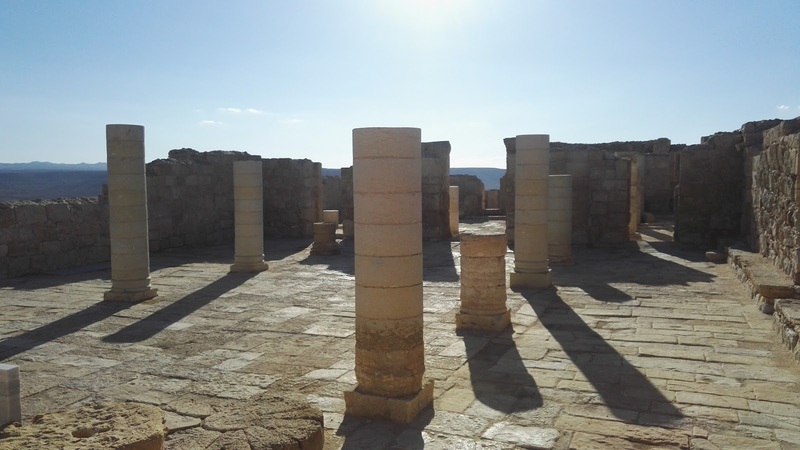 We took the bus to Advat, an ancient town that was a famous stop on the "Incense Road" from Petra in Jordan to Gaza at the Mediterranean Coast and continued on by bus to Ben Gurion, the burial place of the politician of the same name. Next day was not under a lucky star: First my hiking partner spilled two litres of water and had to go back to the last night camp to refill his water supplies from a huge school group that had plenty of water in their school bus. Then one of my Platypus bottles broke and we had to repair it with tape which did not work very well. Then it started to rain ... just as we arrived at the foot of the Karbolet mountains, supposedly the best view on the entire INT. Unfortunately I never saw it. The climb up the mountain is so technical and so steep that I gave up. The rain had made the rock so slippery that my feet would not find grip. After trying to scramble up an almost vertical cliff for an hour I was so scared and near hypothermic that I decided that it was not safe enough for me to go on especially since there is a dirt road route around it. We camped at the foot of the mountain and took the easy detour in the morning. As beautiful as this view is I almost hated that day: People were everywhere screaming and clogging up the steep and difficult ascents and descents. It took us two hours to hike 3 km and again we were way behind schedule. Although the climbing was not really that technical it all was too much for me that day: You constantly had to watch every single step - and you were watched by dozens of seveneen year old teenagers. Although we camped without another soul in an canyon that night the "hunt" continued in the morning when one school class was chasing us until we ran into another teenager group. Now we only had to make it back to the highway before Shabbat started and the buses stopped running ... A steep ascent made us run late again but when we finally arrived at the highway we only had to what half an hour before a bus brought us back to Jerusalem. We spent our last two nights in Israel in a Christian guest house in Jerusalem. New Year's eve is not celebrated in Israel on December 31st so therefore no fireworks for me this year. 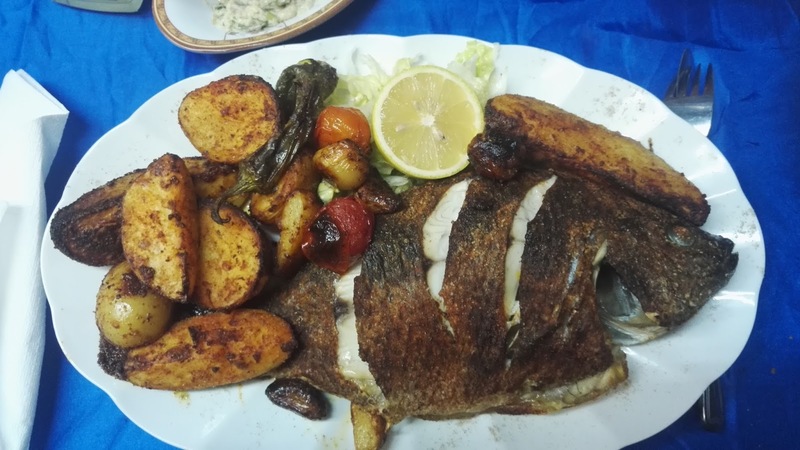 Instead we had a delicious seafood meal in an Arab restaurant before we flew back to Berlin on January 1st. I usually don't post about trips that are shorter than one months but for this recent trip I want to make an exception: It has just been too awesome! So what has happened? I dislike Christmas and New Year's holidays and try to escape them whenever possible. When I was looking for a suitable "refuge" I was surprised to find very cheap flights from Berlin to Tel Aviv - and as the Israel National Trail has always been on my bucket list quickly decided to go there together with a friend for the last two weeks in December. 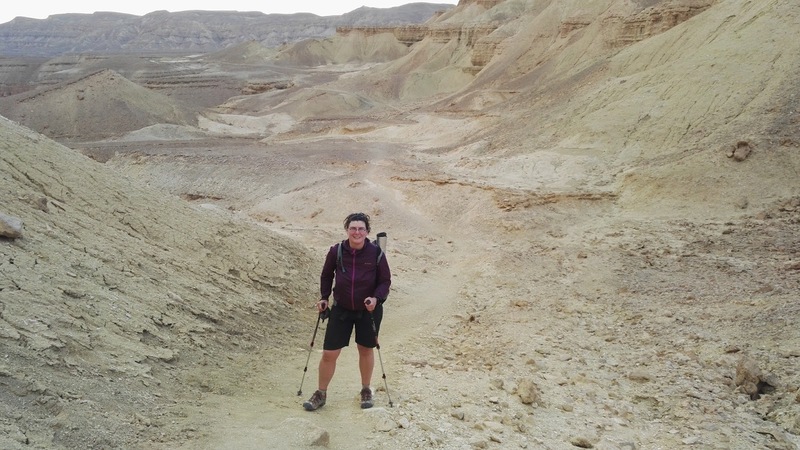 The Israel National Trail (INT) traverses the whole length of Israel in around 1000 km. Two weeks is not enough time to do that so I had to choose a suitable section. I was immediately intrigued by the desert part of the INT but was afraid of water issues in the desert. But coincidence helped me out: My old hiking and paddling friend Buck 30 announced that he was going to hike the INT just a couple of weeks before me and he let me profit tremendously from his experiences. 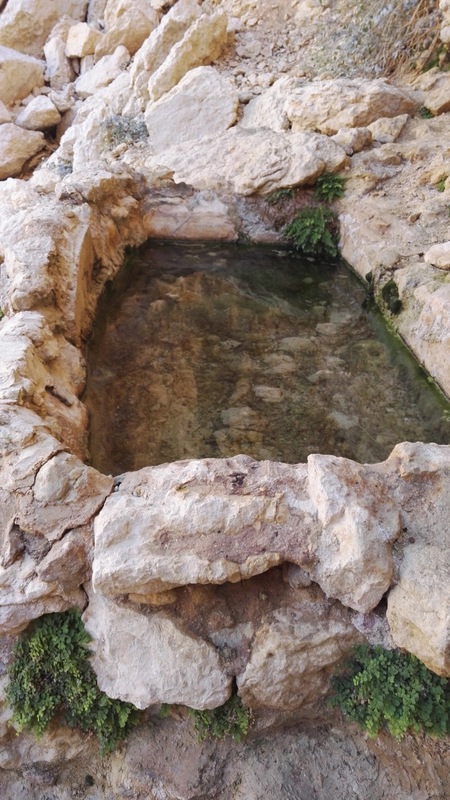 He assured me that water was not as much of an issue on the INT than on the American trails and therefore I decided to tackle the Negev part of the INT which turned out a good decision! After flying into Tel Aviv with several hours delay we spent the first day in Israel in Jerusalem in order to acclimatize and to run errands. But then we were off to Eilat on the Red Sea Coast by bus where we immediately started the INT at 2 pm. The half day showed at once all the beauty - and the difficulties of the trail. It was a steep climb up the first mountain with a breathtaking view onto the Red Sea. But of course everything took way too long and we ended up with a hair raising descent into the first wadi or canyon just when the sun set. 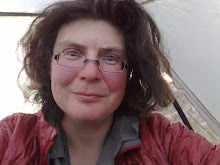 I pitched my tent on the first flat after the descent only to wake up at 2 am with my tent being blown down by the fierce wind ... 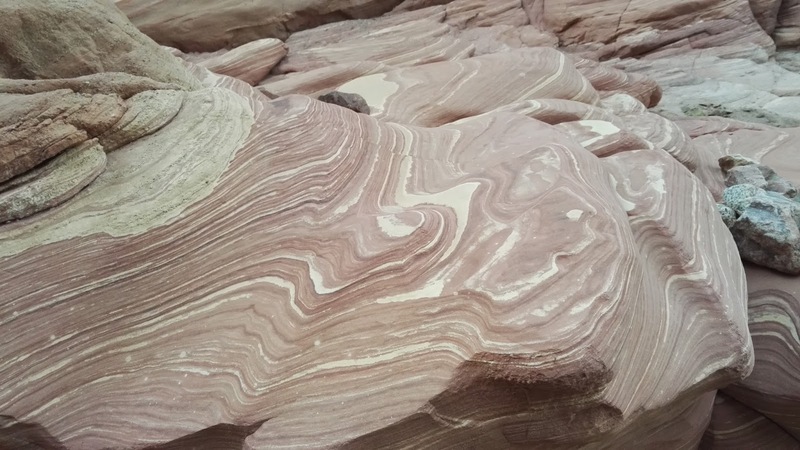 The first wadi took my breath away again - I felt like in Utah with all the beautifully colored sand stone. Next day we reached Timna Park just as the sun set - and four buses with about 100 screaming school kids appeared. 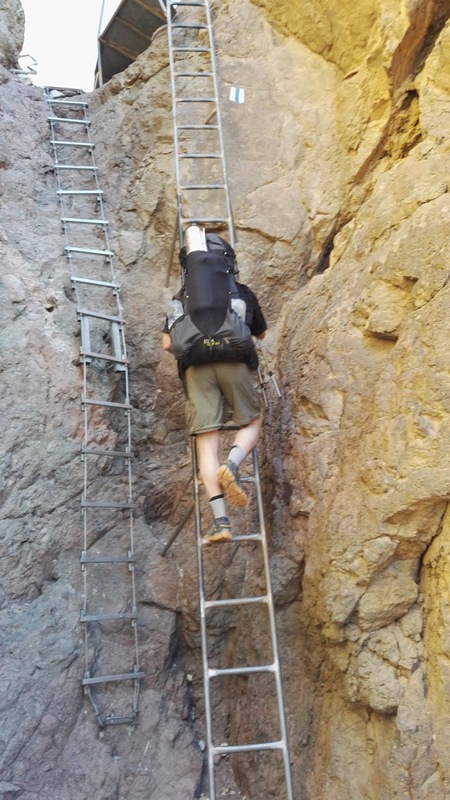 And so it was wild camping for us again ... After crossing Timna Park, a National Park where already the ancient Egyptians had mined for copper we were up for another steep climb up the Eilat mountains - and some more breath taking views before we camped in a side canyon full of ammonites. On Friday we had the "Shabbat" problem: Basically all Israel shuts down for Shabbat - no shops are open, no buses are running. Shabbat is Saturday but it already starts on Friday shortly before sunset. And we were out of food... After some internet research we found a huge gas station close to the trail which was open every day: Yotvata! We detoured from the INT on a very windy and rainy day and still had the most wonderful views - and one of the most expensive resupplies ever ... We ended up buying pita bread and hummus from the cafeteria because most of the stuff in the convenience store of the gas station was totally unsuitable for hikers! But we were very lucky in another respect: From Yotvata we wanted to skip a long boring section of the INT that follows the highway. We had given up all hope to catch a bus on a Friday afternoon and were not looking forward to hitchhike in the rain when a shop assistant told us that there would be one last bus! We stuffed our backpacks with food, ran outside and really caught the bus that deposited us safe and dry in Sapir.